If you don't have snow at your local ski area, you have to go to where it is! 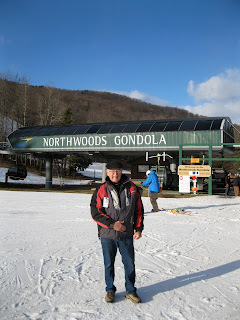 Yesterday was a day of travel and skiing at Gore Mountain. Gore probably is the nearest open ski area from Cortland, New York. Through the good graces of a gang of Cortland skiers that have an annual trip to Gore, I was invited to participate in their activity and have the pleasure of being a passenger. Many thanks to Russ and Mark for sparing me the need to drive. Our departure from Cortland was at 6:00 AM. A bit early for me as a retiree but essential for us to reach Gore in a reasonable time. Actually on the slope by 10:00 AM. By the time we all assembled there were 13 of us in the group. I guess I would identify myself as the only "geezer" skier. All of them were younger with some of them in the aspiring geezer category. The group had been skiing together for over 20 years and certainly had a history. For this geezer it was hard to absorb all the names and faces. Perhaps I have half to two-thirds of them fixed in my mind. I was cordially welcomed into the group and for the most part I was able to keep up their pace for at least a part of the day. Only a few slopes were open by the support of man-made snow. All were intermediate level runs. Most of the players for the day were getting out for the first time or second time. We all were feeling the burn after a few runs. Fortunately for me and I guess for all of us, there were intermediate stops on the way down from the top to rest the legs and share some stories. This was a bunch of very good skiers. Perhaps for the first time I recognized that as I move through the late 70's I am beginning to lose some of the stamina I used to have. In the interests of safety, by 2:00 PM it was time for me to call it a day. One other had the same idea so at least I wasn't the only one to give up early in the day. As the afternoon progressed, members of the group kept trickling in to the lodge. The heroes of the day were those who caught the last gondola just before the 3:45 PM closure. More power to those youngsters. Although there were limited trails open, there was sufficient variety to eliminate boredom. Every run on the same slope can be different. One can take a different line, change the number of turns, and stop in different locations. In addition, temperature, light, and snow texture changes throughout the day. It was a great day chasing the snow. The end of the day was capped with an excellent dinner in Rome, New York and safe travels to Cortland by 9:30 PM. Feeling a bit of a burn in the legs today, but if there was skiing nearby, I would be out there. Let's hope for mother nature to dump some snow soon!